BLACK+DECKER BDEJS600C 5.0-Amp Jig saw is especially ideal for me because of its outstanding performance and at the same time provides me with ease of use. It is good power and stability and has features for added safety and convenience. This review will give you point by point details of this product and why it can be considered as one of your best choice. Have you ever experienced breaking your wood furniture but has no one to fix it at home or no way to bring it to the repair shop? Don’t we always wish that we could do the job by ourselves instead and save us a lot of time and money? Though woodworking requires skills and training, knowing the basic and simple procedure can be learned and mastered as you go on. Because it is in many ways convenient and economical to get things done by ourselves prompt me to learn about the DIY in fixing basic woodworking. And because of this comes the need of a reliable jigsaw to aid me in this whole process. Looking for the best one available in the market can be very confusing because you are not only looking for a couple or few models and brands but several of it! Yet I know the importance of only buying for the best kind even it is only for home use, thus I really spent and took my mind checking each one to before making a choice. From among the sea of options, BLACK+DECKER BDEJS600C 5.0-Amp Jig Saw stood out for me. This jigsaw is a great use for all kinds of woodworking, as it is reliable to cut all kinds of wood, lumber, and others. It is ideal for professionals and those are already master of woodworking because of its features that lets them do the job effectively and efficiently. It is however good for DIY jobs as well because it is made to be easy to use and very user-friendly. Its new technology feature combined with its ergonomic design makes it a reliable and powerful additional for the essentials of DIY. Jigsaw is one kind of saw that uses a reciprocating blade to cut irregular curves in wood, metal, or other materials. It is especially ideal for DIY projects at home because it can be lightweight and easy to use. Finding the best one to fit your needs can be a thorough and overwhelming process, but is something that we should put into great consideration. A good jigsaw is one that can use various wood works and can cut in different sizes with complete accuracy and precision. It should be able to give you different options thereby not only increasing your quantity of output but quality of work. A good jigsaw is one that can be relied to in terms of performance and results but at the same time the length of its usage. It should be made with a top quality of materials, in this way you are not only assuring the sturdiness of this circular saw but at the same time the quality value for your money and works. Working with blades can be very difficult and requires extra effort and precautions to be safe. As much as we want to get things done in a timely manner, we don’t want to sacrifice our safety, of course. While taking personal care yourself already, a good feature of a jigsaw is one that also has built-in safety components that would even secure your protection and ease in cutting and sawing. The effective and easy use may mean for the jig saw to have the best added features that would increase its functionality and productivity and provide you quality performance. It should at the same time be user friendly and hassle-free to use especially if you ought to use it for home. A jigsaw that is lightweight for example may give you ease in handling and will increase your performance and give better results. BLACK+DECKER BDEJS600C 5.0-Amp Jig Saw is a type of jig saw that is built with a 5-amp variable speed motor that generates up to 3000 SPM of cutting power. SPM means strokes per minute, where most jigsaws are measured with. With this increased power, it has higher capability performance-wise as compared to the other jigsaw. It is also designed to make 45-degree bevel cuts in different directions and features an adjustable shoe for a more stable platform. It is made to be convenient to use that with the its keyless blade clamp feature, changing the blades will be an easy-breezy task to do. It is lightweight, weighing only 5.2 pounds, which is just about the right size for this kind of jigsaw. BLACK+DECKER BDEJS600C 5.0-Amp Jig Saw is designed with a curve control technology that will let you adjust the saw’s orbit into one to four customized settings, thereby allowing you to efficiently complete any project at hand. This feature will allow you to move the jigsaw up, down, and sideways as compare to normal settings that is only limited to an up and down movement. This therefore will increase your speed and precision, resulting to a more effective and efficient work. This is also highly beneficial if you will be dealing with different materials. With the 45-degree bevel cuts feature, allows it to cut in different directions. It also features an adjustable shoe for a stable cutting platform. It is built with a 5-amp variable speed motor that generates up to 3000 SPM of cutting power increasing your performance and productivity at a given time. This allows you to cut wood quickly and with outmost accuracy and ease. You will be able to work with hard materials with this one as well. With this feature, you will be saving a lot of time and effort with less energy and time to spend compare to the performance of other jig saw that has lesser amp variable power. With its new improved wire guard technology gives you the clear sight on the saw line to make sure you are cutting it precisely. This feature helps makes it a whole easier for you to adjust and position the blade without spending too much time putting and checking it if it hits the correct mark. That makes your work convenient, also allowing you to save on time to finish a certain project. One very helpful basis in knowing if the product is working well, in good quality and top condition is reading it direct from the people who have actually bought and tried it. This first-hand information will give you all the details you need to know point by point from the ease or difficulty of holding the saw to the usage and quality of output. Most of the people who tried Black and Decker BDEJS600C 5.0-Amp jigsaw like that the blades are easy to change and the wire guide that makes precision convenient to achieve. The output is even remarkable with smooth cuts that are curved really nicely. The speed control works well, and is light to hold and carry than most jigsaws. There is also no question about the power of this jigsaw, as it is capable of cutting different kinds of woods with its orbital settings that gives them more options to cut. Though others have pointed out a few minor hiccups, such as the power cord could have been made with a sturdier material. The trigger is super sensitive even to soft touch. And since the speed is controlled by that triggers some with a good hand for control may find this not a problem but for an older customer, he can only do either high or higher, and finding it hard to get the exact in-between speed. But other than that, It generally works great and with the overall high rating of this product, a lot are more pleased and satisfied than not. In the process of looking and choosing for the best jigsaw to buy in the market, checking other options is an important aspect in the decision-making as it will guide us in knowing its individual strengths and weaknesses and compare each feature to make a sound choice of which for us stood best. You may consider these five other models for a good jigsaw. 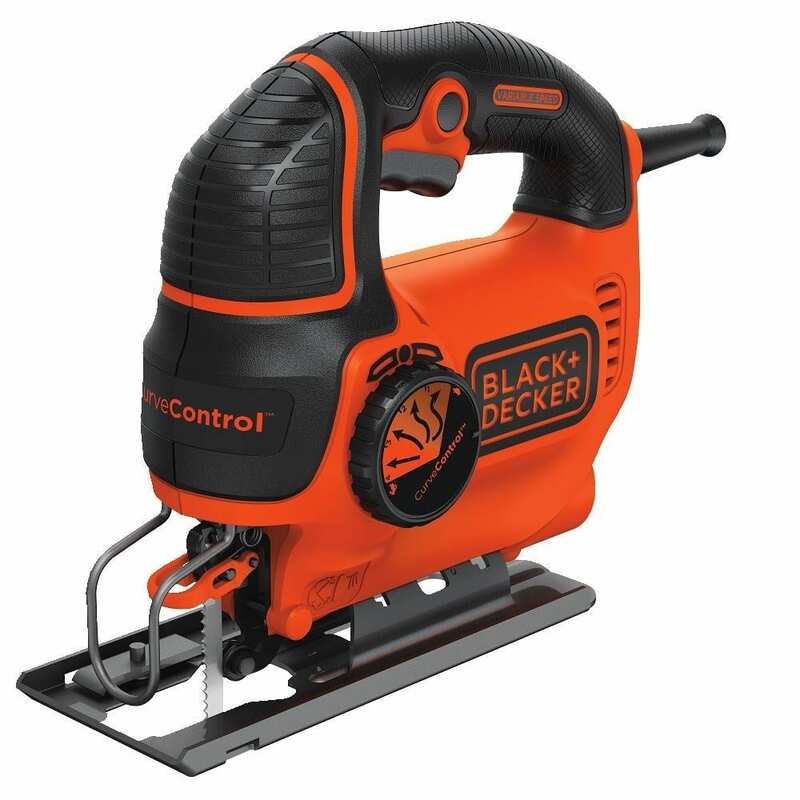 This model also from Black and Decker is designed with a compact handle and a light weight body that makes it easy to use and reduce vibration. It also comes with a dust blower that will keep your cut line clear and you work area clean from saw dust, thus making you work faster without needing to pause and wipe it off. Its other features include a quick clamp for a convenient tool-free blade changes and an adjustable shoe for an added cutting stability. Just like the BDEJS600C, this model also has a new and improved wire guard sightline channel for added visibility and accuracy in cutting and sawing. It is however only powered by a 4.5-amp motor that gives it the ability to compete the task as efficiently as possible. This jigsaw model has a powerful 6.0 amp motor that allows it to cut and saw for a bigger output, at a lesser time. Its other special feature is the built-in laser guide that is very helpful to make accurate cuts. With the red laser, it will be easy for you to see whether you have positioned the blade in the exact place of the line. This is somehow its version of the Wire guard feature of the Black and Decker BDEJS600C that aims increase precision when cutting. A custom molded tool rest is designed for this model to keep the blade in a top notched condition, preventing it from any possible damages. Similar to the Black and Decker BDEJS600C jigsaw model, this also comes with a four-position orbital control setting for a more convenient and efficient cuts. It however doesn’t have a feature like the 45-degree bevel cuts and adjustable shoe that provides more stability in cutting platform. Porter Cable PCE345 jigsaw features a 6-ampo power capability allowing it to cut and saw faster as compare to other models. It is designed with a lock on button that gives an easier control for prolong use of the saw and an oversized front and handle overmold for added control and comfort when used. The same as the Black and Decker BDEJS600C, this too comes with a four orbital settings for a variety of cutting specifications and performance. Other than that, it doesn’t have any feature to make bevel cut up to 45 degree and added component for accuracy like the wire guard that makes cutting easy without the worry of checking it you have positioned the blade precisely on the line. Built with tool-less blade change system and a secure clamping system, this jigsaw has a powerful 6-amp motor making it one with the most efficient in this kind of saw. It comes with an adjustable dust blower to improve precision. What makes it similar with the Black and Decker BDEJS600C is the four orbital-action settings for smoother and variety cuts. It has other features like the variable speed-dial that sets maximum speed, a heavy gauge steel footplate and on-board bevel wrench storage for easy care of the machine. This Black and Decker model is designed with a smart select technology that sets the dial to your task and it will automatically sets optimal orbital setting. Its accurate bevel angle adjustment has a quick action lever and indicator window for accurate bevel adjustment. For improve of visibility and accuracy, this jigsaw is designed with a LineFinder that brightens your cut line. Its other features include the variable speed trigger, onboard blade storage and its tool-free blade change is quick and convenient. For our DIY home projects, choosing the best jigsaw that is convenient and easy to use especially for us who are yet to master the skill of woodworking should be our primary consideration. It also should be safe with the added features to ensure us that and flexible to use to any kind of woodwork and projects. Considering all the options, we personally prefer the Black and Decker BDEJS600C 5.0-Amp Jig Saw because if fit our needs and criteria. Despite certain limitations, it however exceed our expectations on other areas that matters more for us. We especially like its capability to make bevel cuts up to 45 degrees in both directions as that will provide us with the versatility that we would want in making different wood projects. Its improved wire guard is also a helpful and useful feature for us because accuracy of cut is something that is difficult to achieve and master. Having the guide to help us through will allow us to work faster but accurately.